It’s time to present an overview of applied, related, modified and created ontologies and vocabularies I’m currently working with. 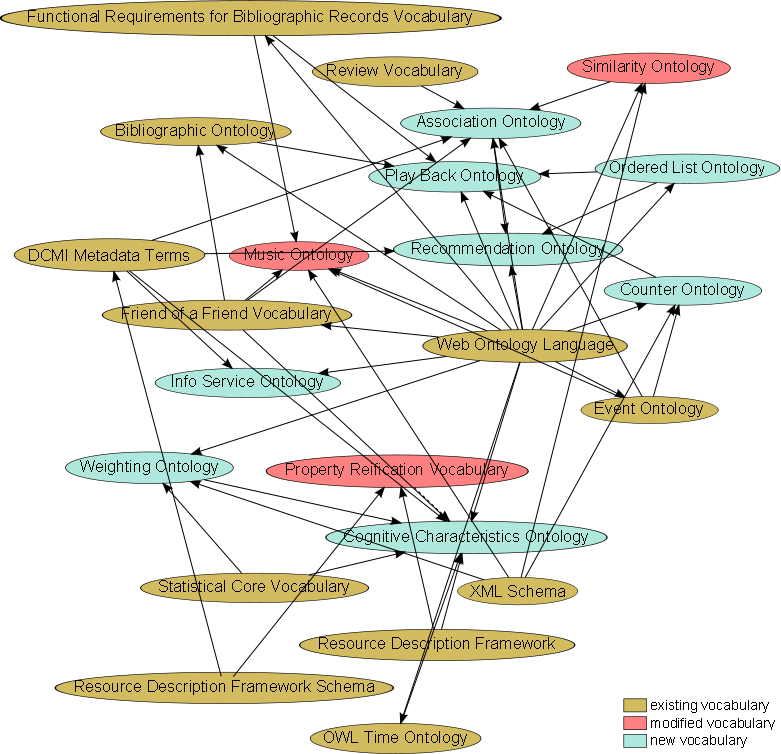 The graphic above shows an overview of applied ontologies and vocabularies in the knowledge representation model of the personal music knowledge base (PMKB). One can see the reutilisation of existing Semantic Web ontologies in new ones and furthermore, also their application in other new Semantic Web ontologies. A link from one vocabulary to another one was created, when at least one sub class, sub property, domain or range relation to another vocabulary exists. Some existing Semantic Web ontologies were also modified during the development process for required universals for the knowledge representation model of the personal music knowledge base. In the following are reference to the specifications of the mentioned ontologies, vocabularies and schemata. This entry was posted in description and tagged Association Ontology, Bibliographic Ontology, Cognitive Characteristics Ontology, Counter Ontology, DCMI Metadata Terms, Event Ontology, Friend of a Friend Vocabulary, Functional Requirements for Bibliographic Records Vocabulary, Info Service Ontology, Music Ontology, Ordered List Ontology, OWL Time Ontology, Personal Music Knowledge Base, Play Back Ontology, Property Reification Vocabulary, Recommendation Ontology, Resource Description Framework, Resource Description Framework Schema, Review Ontology, Semantic Web Ontology, Similarity Ontology, Some More Individual, Statistical Core Vocabulary, The Web, Web Ontology Language, Weighting Ontology, XML Schema. Bookmark the permalink.